The Nigerian Army on Thursday said Boko Haram terrorists now evade drones and aircraft surveillance by hiding in makeshift camps covered with shrubs. Col. Sani Usman, the Acting Director of Army Public Relations, revealed this new tactic in a statement in Maiduguri. Usman said in the statement that the discovery was made during a clearance operation in the North Eastern area of Kumshe in Borno. "Troops of 7 Division Strike Group Team B, attached to 21 Brigade have braved harsh climatic conditions to clear seven villages of Boko Haram terrorists’ presence in the North East of Kumshe village. "The villages are Mulfuta, Baibawa, Jenere, Bembem, Maksamari, Bula Kafie and Bula Bodi. "The troops discovered that the Boko Haram terrorists have evolved new tactics of evading surveillance by drones and aircraft. They now hide in makeshift camps covered with shrubs", said the statement. It added that the troops recovered some motorcycles, two Dane guns, large quantity of foodstuffs stored in a well constructed storage facility and solar panels. It stated that the troops proceeded to Bembem, "where the suspected Boko Haram terrorists also laid an ambush for them. "It was, however, cleared successfully although a soldier sustained gunshot wound during the clearance. He has been evacuated and receiving treatment. "The team discovered and rescued some hostages held by the Boko Haram terrorists in the area." It pointed out that although the patrol team did not encounter any terrorists in Maksamari, they made a very rewarding recovery of an invaluable communication gadget. "Through it, the troops discovered the terrorists new tactics and dispositions", Usman said in the statement. It said the troops had also shot dead four suspected Boko Haram terrorists after another operation at Kircha Dungus village and surrounding environment. "Troops of the 155 Task Force Battalion carried out a swift clearance operation at Kircha Dungus village and surrounding environment. "This is a follow up operation to ensure proper clearance of suspected Boko Haram terrorists hideouts and prevent the fleeing terrorists escaping from Operation Crackdown. 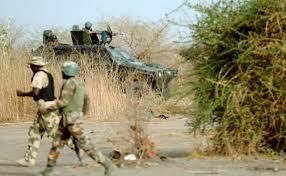 "During the operation, the troops encountered pockets of the Boko Haram terrorists in which they killed four of them. "A few others fled, leaving behind four women and a child. The troops have rescued and evacuated them for screening and further rehabilitation." The statement said a pair of military desert camouflage uniform and a generator set and water pumping machine were recovered. It also said troops of the newly created 8 Task Force Division have commenced operations in earnest. ""It is in line with this that the troops of 153 Task Force Battalion conducted aggressive patrol to Gudusuri, Malalewa, Khadaamari, Rundi and Mugu villages in northern parts of Borno State. "Although they did not encounter Boko Haram terrorists in the area, the troops recovered five vehicles, six motorcycles and one Boko Haram terrorists’ flag. "In same vein, some elements of the same unit deployed at the Forward Operation Base (FOB) Old Marte, conducted another patrol to New Marte yesterday to clear suspected remnants of Boko Haram terrorists hiding in the area."